Wild rockweed grows on the coast of Cape Elizabeth, Nov. 6, 2015. In the March 28 BDN article about the Maine Supreme Judicial Court ruling on rockweek, Acadian Seaplants President Jean-Paul Deveau laments the 7-0 vote declaring intertidal rockweed the property of the intertidal landowner. He calls it “extremely unfortunate for an entire industry and Maine’s economy,” and calls Acadian’s harvest “sustainable.” As plaintiffs in the case, we disagree. 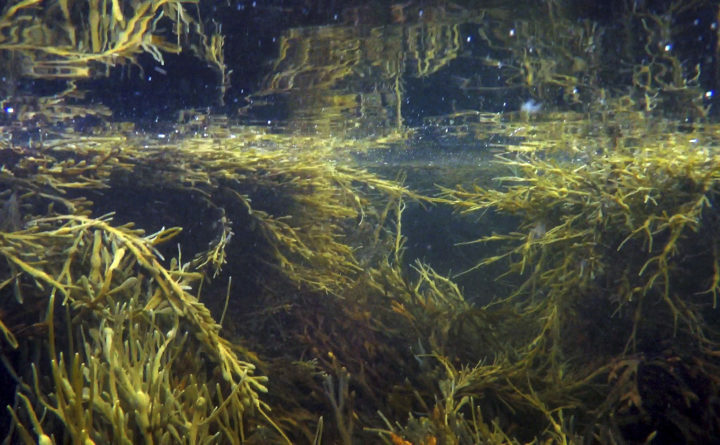 Maine’s growing rockweed industry actually increases pressure on fisheries and wildlife already in decline from overfishing, invasive species, pollution and climate warming. Maine’s economic future depends heavily on the health of its marine resources. Large-scale rockweed cutting is a good example of the wrong way to manage these resources. The court’s decision supports true economic sustainability by protecting marine habitat at the foundation of our coastal economy. For years, the Maine Department of Marine Resources and rockweed companies have claimed that rockweed cutting in Maine is a “$20 million” industry, with no economic data to back that up. In 2018, harvesters, some non-residents, cut about $820,000 worth of rockweed. This addition to Maine’s economy, in dollar value, is near the bottom of all species tracked by Maine’s marine resources department. A fair study of the full economic impact would also include the damage done to fisheries, wildlife and tourism. The rockweed companies argue that the harvest must be sustainable because their annual take is only about 1 percent of the total rockweed biomass in the state, far less than the estimated amount detached by waves or ice. They don’t mention the naturally detached rockweed that stays in the ecosystem and rots to feed other species in the Gulf of Maine, unlike the 1 percent they take. Nor do they acknowledge that in a fragile ecosystem, removing 1 percent of a fundamental part can have much more than a 1 percent impact on other parts. Many species live on the borderlines of survival in terms of food, shelter and temperature. And the industry’s take of rockweed has been escalating rapidly, with no upper limit in sight. Many fishermen have welcomed the court’s decision. As Maine coast natives and landowners, we are convinced that the seaweed will be better off under private rather than state ownership, and that our shorelines and fisheries will be more economically productive if rockweed cutting is held to a low level. This is because the rockweed is habitat for lobster, juvenile fish and other creatures at the bottom of the food web. Shorebirds, eiders and black ducks depend on the prey they find in rockweed. To cut off and sell the base of an ecosystem for fertilizer, the bulk use of rockweed, is counterproductive. Harvesters insisted on the right to take rockweed from parks, biological stations, conservancy preserves and lands under conservation easement, even while owners objected. All this while the Department of Marine Resources acknowledged ownership of rockweed to be unsettled law. Such boldness may reflect modern business practice, but it speaks poorly of the way we treat our resources and each other. In Cobscook Bay, harvesters have been allowed to cut 17 percent annually of the rockweed in their assigned sectors. Now fish, mussels, ospreys, ducks, herons, gulls and other birds are scarce. We don’t blame this necessarily on rockweed harvesting, but every additional disruption grinds down an already weakened ecosystem. If we continue as usual, Cobscook will have nothing left but scenery. Acadian’s “sustainable” and “environmentally friendly” claims ring hollow. The “sustainable” claim is based on volume of regrowth, not the impact of removing seaweed on the ecosystem. The National Ocean and Atmospheric Administration recently declared rockweed as critical habitat for cod. And rockweed is ranked by the Gulf of Maine Council on the Marine Environment fourth in importance among 151 species. In a world of multiple threats to our oceans, this out-of-date, narrow focus on the amount of rockweed regrowth as an indicator of “sustainability” won’t fly. The Maine Supreme Judicial Court decision is a win for fishermen, for wildlife and for Maine. Ken Ross is a retired political scientist. He lives in Ann Arbor, Michigan, and Robbinston. Carl Ross of Calais is a retired electrician. The brothers grew up on Passamaquoddy Bay and own land there and on Cobscook Bay.